Currently, it is on a plain on the opposite shore. It has an area of 23.1 km2, it borders the villages of Olula del Rio, Macael, Cantoria, Oria, Líjar and Partaloa and is 100 km away. From the capital. This town owns the payments of the Vega, the Umbria, the Morales, the Prao, the Murteras, Frasco Esteban, Balsa del Porro, etc. Its population, as of January 1, 2003, was 1,986 people. Villa located in the marble area, main economic activity of this and all the surrounding villages. The surrounding lands are dedicated to the cultivation of cereals, corn, olive trees and vineyards. The parochial Church, of Mudejar style stands out from the urban set. Internet is an open door to the world of knowledge and information and from the Town Hall of Fines we want to take advantage of the resources that this giant of communication puts at our service to create a meeting place between the institution and citizens. We also want this location to serve as a guide for those who visit us and a letter of introduction for those who look for the first time at Fines, from anywhere in the world. I hope that you not only visit this page but that you come to this beautiful town and enjoy the hospitality of your neighbors, its marble museum outdoors, its green way, its beautiful corners, etc. The Villa de Fines, is located on the left bank of the Almanzora River, in the so-called Marble Region, with 2000 h and 21 square km of surface. It is thought that its etymology is “Finis – Finis”, from Latin, whose meaning is end, or limit. Undoubtedly, the town must have been the limit of some of the territorial divisions constituted during Roman rule. This Villa belongs to the Judicial District of Huercal Overa. Fines is the typical village that has evolved, in spite of being agricultural (orange and grapevines), and industrial (elaboration and craftsmanship of marble). Although the first marble factory was installed in Fines in the early years of the nineteenth century, the truth is that until the 1960s (1960), you can not consider Villa de Fines with great industrial roots, compared to the neighboring towns of Olula del Río and Macael. Nowadays there are more than 100 marble elaboration and crafts workshops, as well as 10 large marble factories. The festivities are celebrated in honor of San Esteban, Patron of the Villa, parties with great success in the region, since all the performances are free and are held in the Plaza del Ayuntamiento. 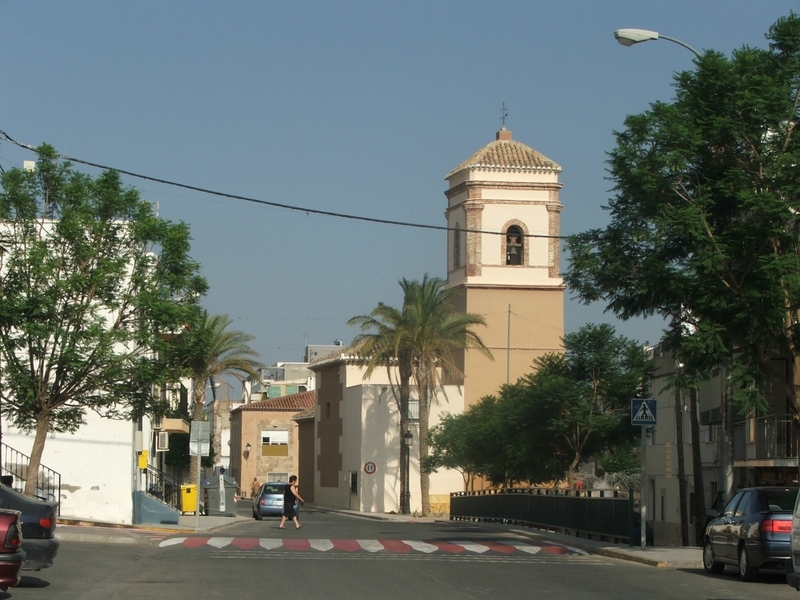 Going back in time, Fines, like the other towns of Alto Almanzora, now called Comarca del Mármol, was a small and quiet town in the Arab era. The performance of a Moorish of Fines, caught the attention of the victor of Lepanto, as well as several writers of the time. The Tuzani was a remarkable Moorish of the town of Fines, according to the writer Ginés Pérez de Hita in his book, History of the Civil War in Granada. The prominent Moorish in his frequent visits to the city of Purchena, fell in love with a beautiful dwelling, the sister of the Moorish chief Jeronimo. The beloved of the Tuzani, once the war began, for greater security took refuge in the house of relatives of Galera, being stabbed by a Christian soldier during the siege of this population. Informed the Moorish that the author of the death of his girlfriend was in Tíjola, villa that was surrounded by the army of Don Juan de Austria, joined the soldiers with the purpose of discovering it, but Tuzani was arrested and brought to the presence of Don Juan de Austria, to whom he told all his tragic love story, that moved, ordered him to join his army forgiving his life. Incorporated into the army, he came to discover that the real murderer of his “great love” had been one of his best friends, who by mistake killed the Moorish woman, and when he discovered his beautiful face, he ordered him to make a portrait, which he would show the Tuzani and he, recognizing his girlfriend, challenged him in a duel and killed him. After being put on trial, the Tuzani was acquitted and Christianized, ending his days in Cehegín. Ginés Pérez de Hita, in the aforementioned book, comments that years later, on one of the trips he made to Madrid, he met Tuzani, old and sick, who reminded him of his great love, teaching him a small portrait of the Moorish, stating the author who had never seen such a beautiful woman. This sentimental story transcended in such a way that it inspired the writer of the Golden Age, Calderón de la Barca, the argument of his work “Love after death”, although the facts do not fit correctly to the geographical reality. Formerly, Villa de Fines, which was located on a rocky hill on the right bank of the Almanzora River, was delivered in 1492 by the Catholic Monarchs to Don Alonso Fernández de Córdoba, Lord of Alcaudete and Montemayor. Currently, it is located on a plain on the left bank of the river. 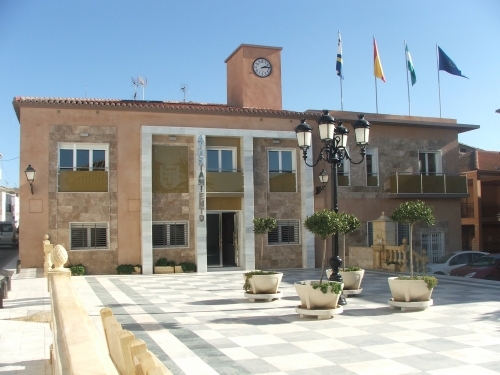 This town shares the railway station with Olula del Río, on the line from Lorca to Baza, which is currently paralyzed, despite the agricultural activity and the marble from Macael. An important episode is that in 1837 took place the installation of the first modern marble sawing and grinding factory that was established in Spain, which was moved by hydraulic power, thanks to the waters of the Almanzora River, and mounted two large machines, one of sawing and another of marble polishing. We now talk about the Shield of the town of Fines. 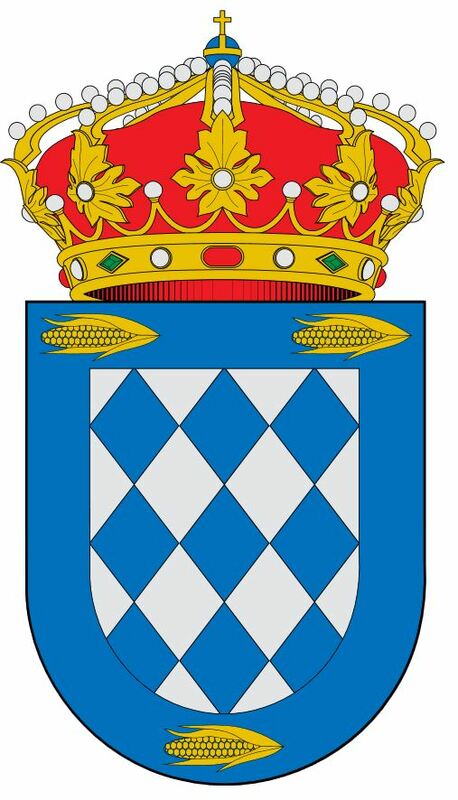 There are data that confirm that the existence of the shield of the town is not registered until the beginning of its use from January 1850, being October 9, 1876 when the mayor Don José Villarreal records it; today it is possible to study it in the section of Sigilografía of the National Historical File, within the Series of shields in municipal ink. Its structure is based on the two main historical and current activities of the extraction and elaboration of marbles, being definitively constituted on February 26, 1981, “the silver and blue” with blue embroidery with three gold ears arranged at both ends superior and in the lower center: it is stamped with a real circular crown of Spain set with precious stones, composed of eight clusters of hawthorn leaves, interpolated with pearls and from whose leaves come many other diadems. A shield is also kept with the arms of the Álvarez de Monteserín family, protected and conserved by the Regional Government of Andalusia. 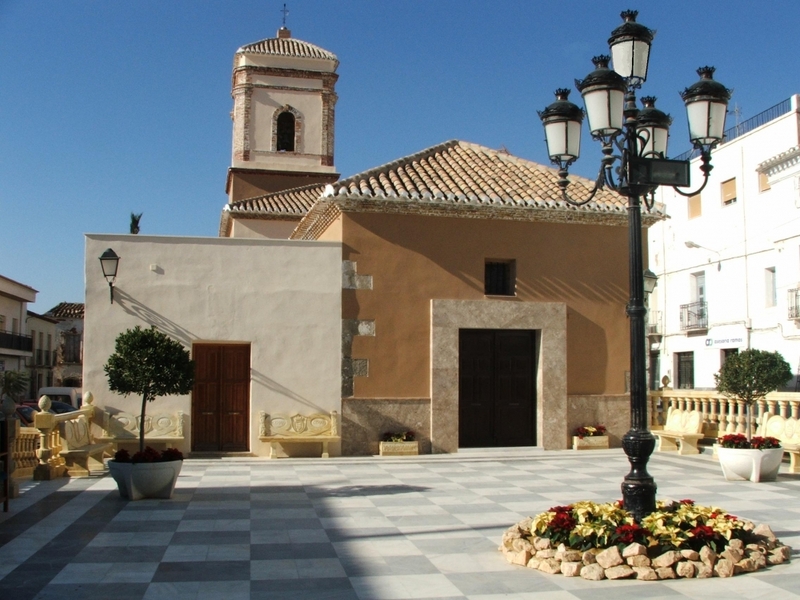 Its Parochial Church, which is dedicated to Our Lady of the Rosary, was built when in 1631, the population of the State of Tahal was consolidated, it is planned to build churches in which to celebrate the Holy Offices and it is requested of the Bishop and Mr. Marqués to of the income obtained thanks to the tithe. Its Mudejar style stands out, above all in the roof, of “limabordón” with three pairs of braces decorated with eight-pointed stars and ribbons of four. This Church has been rebuilt, but fortunately it has not lost its beauty. On Resurrection Saturday, the young people of the town on the so-called “night of the signs”, paint the facades of the houses with signs dedicated in azulete to who they like, dislike, love or hate. Everything is “allowed”, without excesses. This tradition is shared with towns such as Felix, in the Sierra de Gádor. “The Day of the Snacks” is celebrated in Fines on Easter Sunday, in which the villagers go to enjoy a pleasant picnic. There are, of course, many more traditions, such as Carnival or the Day of the Cross. 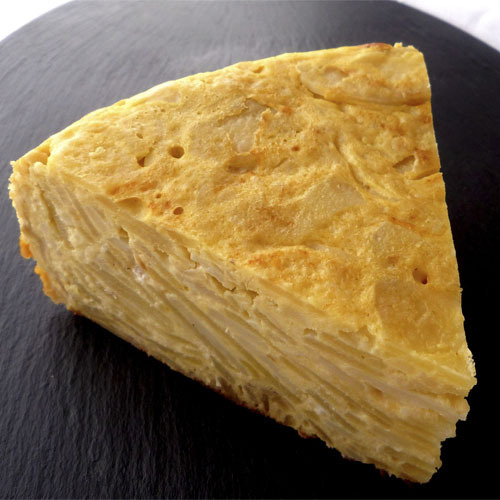 The typical gastronomy of Fines is varied, succulent and, in general, very similar to that of our entire province. 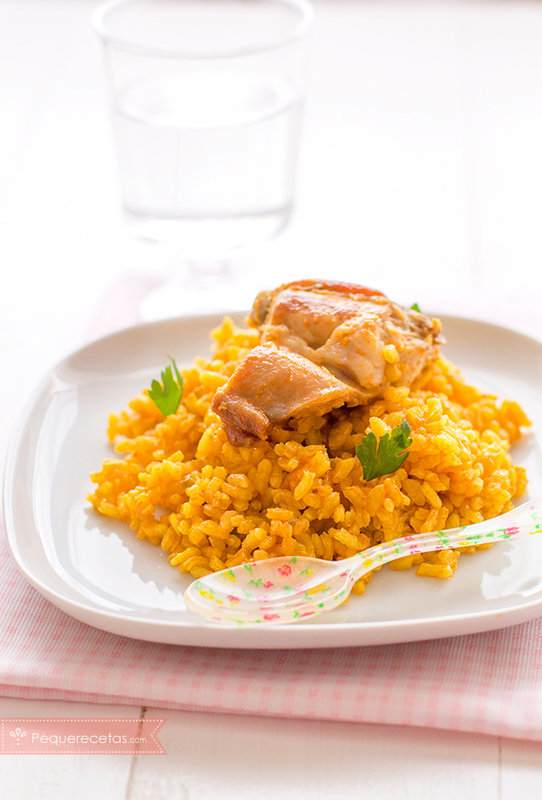 Visiting this wonderful locality we can appreciate, like typical dishes, crumbs, rice with rabbit and chicken, omelet of potatoes, of garlic, of asparagus; puchero with black pudding, paprika, the so-called “balls”, gurullos, porridge with fish and milk and a long list of appetizing delicacies. This traditional festival is celebrated in honor of its patron Saint Stephen, consists of placing basil sprigs around the saint just before the procession, this basil is blessed by the parish priest in the name of the patron, which at the end of the procession procession the neighbors approach to take it from the feet of the Patron. Before Todos lo Santos Day, on October 30, the villagers gather in farmhouses where they prepare large feasts and roasted chestnuts to celebrate the arrival of the chestnut season. The festivities in honor of San Esteban are celebrated the first days of August, begin with the celebration of the day of the child where different acts are performed, among them, the performance of the Cultural Musical Band of Fines where they offer a concert with several themes of its wide repertoire, we also count the performance of our Municipal School of Dance in which several groups of children make us spend a pleasant evening with their dances both typical and modern ending with the dance of the teacher. Afterwards, the children go to enjoy the attractions of the fair, all enlivened by a great roll of rockets. The first day of the fair is opened with the traditional lighting, and then go to the town hall where the town crier, the greetings of the Mayor and Councilman of Celebrations give the kick-off to the fair. Later the Ladies and Queens of the parties are chosen where they are given the traditional band, wreath and bouquet of flowers and the Baby of the year (last baby registered before the holidays) giving them a big basket of newborn and a baby band of the year. The day of the patron Saint Stephen is celebrated with a large number of rockets throughout the day, in the afternoon the mass is celebrated in honor of the patron who adorned “basil” walks through the streets of the village enlivened by the Cultural Musical Band and shooting of rockets. It is a well-known custom that in the square the orchestras act up to the high hour of the day as the agreement of young people is spectacular, ending with the sun of the day, with the traditional breakfast of churros with chocolate. The end of the fair is celebrated at dawn with a spectacular fireworks castle on the Greenway. These are days of joy and fun where all the villagers and visitors enjoy the festivities to the full. 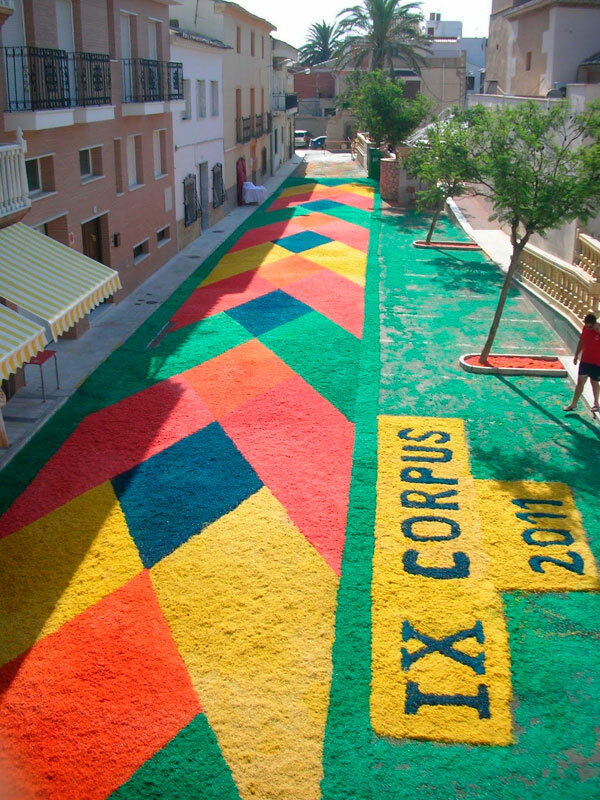 On the occasion of the Lord’s Day, a large carpet of tinted sawdust with floral motifs is made in Calle de la Iglesia, made by the government team and volunteers of the town, an activity that has been taking place for 12 years. It is known about it from the year 1877 and was restored in 2004. The water it carries is good for consumption, it has a kind of drinking fountain where the animals used to drink. It is normally used for irrigation. The flow is low, although it never runs out. In April 2009, the public picnic area next to the fountain was inaugurated (where the old laundry room, which was used by women at the end of the day), was equipped with tables, barbecues and services. This fountain is famous because on the night of San Juan it is tradition that people go there to wash their faces, because according to legend you will remain young for life. In this urban tour highlights the rehabilitation of the old stone railway bridge that exists in the municipality in its boulevard-like boulevard, known as Museum of Outdoor Sculptures. Throughout its layout we can find numerous and varied sculptures of marble product of the quarries of Macael, that pay homage to different countries, different cultures and great geniuses such as the poet Federico García Lorca. The Parochial Church of Our Lady of the Rosary consists of a single nave with a main chapel and a choir at the foot. The ship, which originally had niches pierced in its walls, is covered by a rectangular file armor with decorated almizate at the ends. The almizate corresponding to the choir has an ornamentation based on cloths tied with eight-pointed stars, in whose center a rosette appears. However, the one near the headboard reduces its decoration to eight-pointed stars. Outside the Parochial Church of Our Lady of the Rosary stand out the main portal and the tower. The cover has a flat access doorway, highlighted by wide moldings. On the aforementioned vain is located another flared, topped by a cross. The tower, located in the left corner of the head, has three bodies separated by moldings. Fines has the largest marble sculpture in the world built in one piece, which pays homage to women victims of gender violence and is called Freedom. The perfection of this work does not leave anyone indifferent, with a symbolism that already imagined the sculptor, painter and designer of this sculpture, Andrés García Ibáñez who shared the talent of Manzano in this carving as an executing arm. Andrés García Ibáñez, defines this work of Laica with a lot of sacredness; a figure that takes flight and conquers freedom. “The design of a woman in the fullness who looks at the sky and seems to start an ascension. 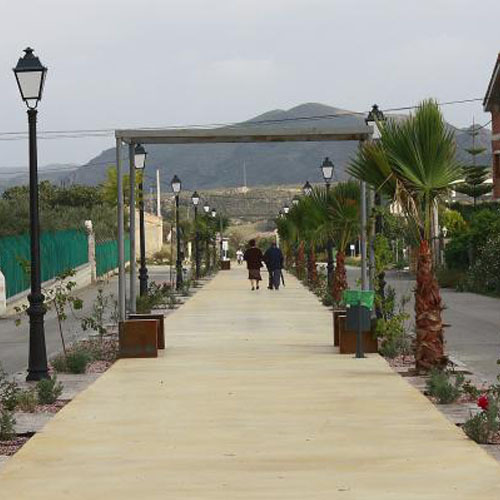 The sculpture is placed at the entrance of the town, in the viewpoint Rosa Galera, a tribute to the neighbor of the municipality that lost its life three years ago at the hands of his ex – partner. What to do in Fines? If you are thinking of taking a different trip to discover beautiful places and charming towns that are not usually well known, a getaway to Fines is an excellent option. Our town has many options to make and we recommend the ones that are sure to be of your interest. 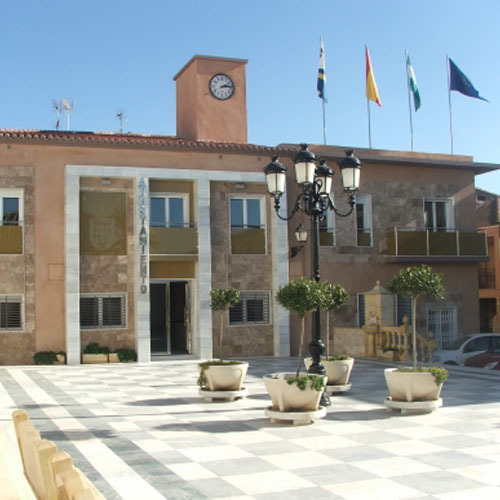 Hostal El Polígono is located in the town of Fines, municipality of Almería, in the region of Valle del Almanzora. In the Hostal El Polígono you will enjoy a comfortable rest in an environment that will seem as if you were in your own home, thanks to the kindness of the staff. You can also enjoy delicious local cuisine in the restaurant offered by the hostel, as shown by its excellent wheat pot. It has a service area. Autoreparaciones A. Mora, mechanical workshops in Fines (Almería). We have multi-brand vehicles and professional extras that will advise you on your purchase. 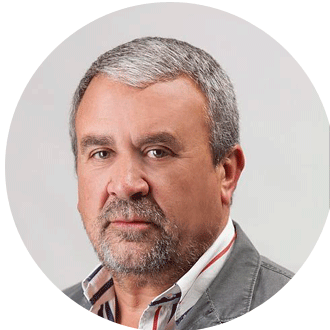 Enterprise data Company dedicated to the sale and repair of cars for 30 years, in the sector of mechanics, electricity, paint, tires, etc … Specialty in the multi-brand Automobile. Our services Multibrand vehicles Buying and selling vehicles Mechanical workshop Painting workshop Tire Service Electromechanics Etc..
Travel agency in Almería since 2005. Personalized treatment to offer the best services to our clients. Cruises, travel discounts, group travel … Viajes Fines travel, in Fines – Almería. COMPANY DATA In Viajes Fines Travel we think that a trip is a vital experience that leads the protagonists to live dreams and illusions. We believe that each one of us has the right to live experiences in their own way and therefore we propose that each one choose how they want to travel. In Fines Travel you will find customized trips, adventure trips, coasts, islands, Caribbean, cruises, circuit, group trips, etc. Any trip you can imagine you will find here because we think of you. Visit us without obligation, we will be happy to assist you.